Are small nuisance ants invading your kitchen, bathroom, or anywhere inside your home? Order service online! If you currently have tiny ants crawling inside your home, please follow these steps for online checkout or call our office to request a FREE estimate. Please note that if you are seeing large black ants nesting in wood, you likely have a carpenter ant problem which can be scheduled online here. Our One Time Ant Service costs $225 and is 100% guaranteed for 90 days. Ants gone! You can expect to see at 50% reduction in ants within 2 days and 90%-100% reduction within 7-10 days. An estimate is not required for small ants inside your home. You can now conveniently purchase and schedule service online by clicking the Schedule Now button. While we cannot guarantee same day service, we will do our best to accommodate this request. If we cannot provide same day service, next day service will be provided unless otherwise specified. You can expect to see at 50% reduction in ants within 2 days and 90%-100% reduction within 7-10 days. If you continue to see high levels of ant activity after 10 days, please call our customer service department for fast technician dispatch. Unlimited, free treatments are available to you within the 90 day coverage period. There are several types of ants (pavement ants and odorous house ants) that are common invaders for New Jersey and Pennsylvania residents. Small black ants that are less than ¼ inch are typically referred to as “nuisance ants.” These types of ants are what you would usually find in kitchens and bathrooms, mostly during warm weather months but also year round. Are you seeing large black ants that are larger than ¼ inch? 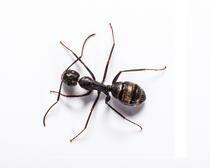 You are probably seeing carpenter ants which are not covered by the 90 Day Ant Service. However, Cooper does provide both preventative and reactive service to combat carpenter ant infestations at residential homes. Please call us at 1-800- 949- 2667 to learn more about our carpenter ant programs. Once our state-certified technician visits your home, they will inspect for potential entry points and food sources that are drawing the ants into your home. After gathering this information, they create a customized approach to ant control. In order to create a protective barrier around your home, the technician will apply treatments to the exterior foundation of your home. In addition, gel baiting will be placed in discrete areas where ant activity is high indoors. Common placements for gel bait include window frames, pipe chases, and base boards. If after watching or video and reading our FAQ's you still have questions, please give us a call. Why Choose Us for Ant Control? Since 1955, thousands of homeowners within NJ and PA have trusted Cooper to solve their pest problems. Our knowledge, training, and reputation is second to none. Avoid the hazards of DIY, we will safely eliminate ants from your property.